When you get on the water, your primary plan can change in a hurry. With the recent storms rolling through the region, often times outings on the water are either cut short or not even attempted. So far, my quest for a citation this year has come up empty with only one real potential fish hooked that came unbuttoned back in the spring - that being a speckled trout. When Friday rolled around for my scheduled day off, naturally I reached out to a few trout addicts and put a bug in their ear to join me, but I was only able to ensnare one person, my good buddy Joe. Joe and I share a passion for fishing so much so that benign days often tempt us into taking a day off from work. 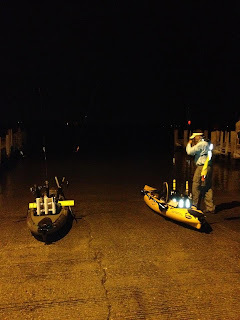 We both fish out of Hobie Revolution 13's, so getting to our spots quickly is not a problem, plus if the weather takes a turn for the worse, I know we can both get off the water fairly quickly and safely. We both looked over the forecast for the area and agreed that the conditions looked favorable: high 70's with overcast skies, a light easterly blowing wind, and no rain forecast until after lunch. Perfect conditions we thought for a potential top water bite or at least some active feeding fish. Combine that with an incoming current and you had the potential recipe for an exciting morning of fishing. We started off working some top water lures in and around the shallow flats along the grass lined shores and some deeper holes looking for some willing takers. Nary a bite to be found. Lots of finger mullet busting the surface, but no action for either of us. As the sun rose above the cloudy horizon, the morning took on a muted glow and the sounds of the crabber's flat bottomed boats slamming against the incoming waves crests were the first indicators that the waves and wind were yet again not going to be our friend today. As we approached the primary target area, the winds picked up in earnest and the wave chop got a tad more rougher than we would have liked. I positioned myself to drift along a channel edge and oyster bar, while Joe worked a parallel channel. I stayed true to my top water plan for about an hour, until I lost confidence in the plan. I switched it up to my favorite jig and plastic combo (Marsh Works Bull Red Jig Head & Bayou Thumper) and immediately started getting some action. Nothing of any significance but at least some nibbles here and there with a couple obligatory tell-tale swipes at the lure. After a couple minutes, I learned what the action was - a 24" Ribbon fish or cutlass fish as commonly referred to. Nasty teeth, but they do fight nicely. Was able to get him to me in time to grab the leader just as he thrashed about and cut the line. Not a good scenario - holding a thrashing fish with pronounced teeth in my lap. Needless to say, I passed on the photo op and escorted the ribbon fish out of the kayak to live and fight another day while protecting my "fortitude" so to say. The down side to this scenario was having to re-tie my leader to my primary line - flouro to braid, in windy conditions. Not an easy task, especially when I prefer to tie an Alberto knot. After a few minutes of struggling with it, I managed to re-tie the leader and went back to fishing. On the next drift along the bar, I landed a fiesty little redfish that obviously had big expectations in life. He was 8" at most and slammed the 4" bait offering. Nothing photo worthy, so back to the water he went. The winds were not too strong, so each drift lasted a good 5 minutes before I would turn the kayak into the wind and slowly troll back to the top of the bar. On the third troll back, I landed my one and only speckled trout for the day - a 14" spike. Not much of a fight but still a trout was on the board. A few more drifts and I added two more new species to my list of caught fish this year - an over zealous pinfish and a sea robin. Having never seen one prior to Rob Choi's photo of the one he caught a few weeks ago, I didn't even know they existed. Pretty cool looking creature and yet kind of scary looking for the first time I had ever seen one that up close and personal. As the sun crept higher in the sky, the crabbers were out in force, so I made a call to Joe over the radio to see how he was doing and discovered he had the same thought I did - find a place that provided a little more of a wind break and away from the noisy activity associated with crabbing. Joe positioned himself near the inlet just behind the rock wall and worked the eddy line there, and I took up a position on his left to work the outer edge of the jetty wall. 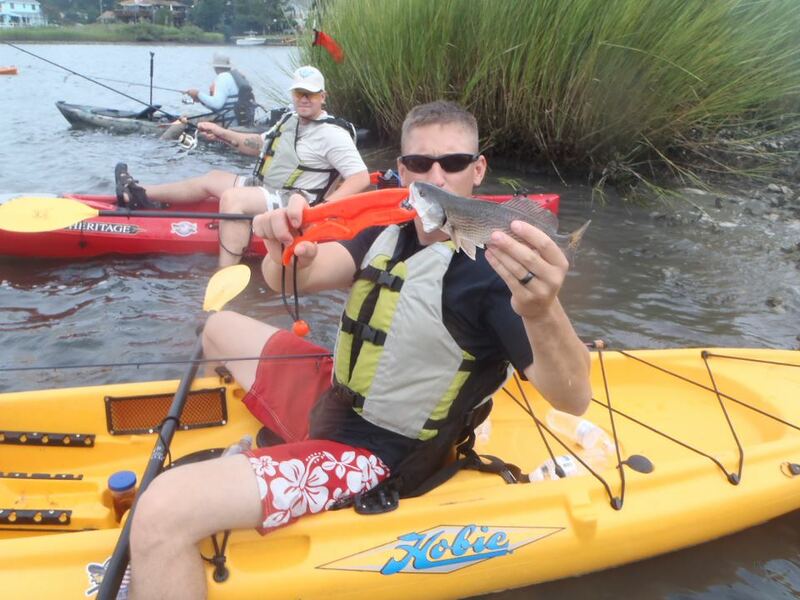 Joe landed a couple fish in that pocket - a small trout and a small redfish. I had one good hit, but no takers. After a few minutes of this, I even tried the mouth of the inlet where I lost that 30"+ striper the previous weekend but no luck. We both drifted along at a snail's pace working the banks for any willing takers. For the next hour, we took turns it seems catching small redfish. Joe would hook up and land his red then release it. Not a minute later, I would have one on and the cycle would repeat. Nothing of any great size mind you, but still catching fish is simply that, catching fish. As the creek meandered back further into the serene and peaceful landscape, the creek began to split and created several ambush points for any potential predator. We worked the ambush points and landed a few more before finally reaching a point where we decided to turn and make our way back. Until next time, tight lines and be safe!! 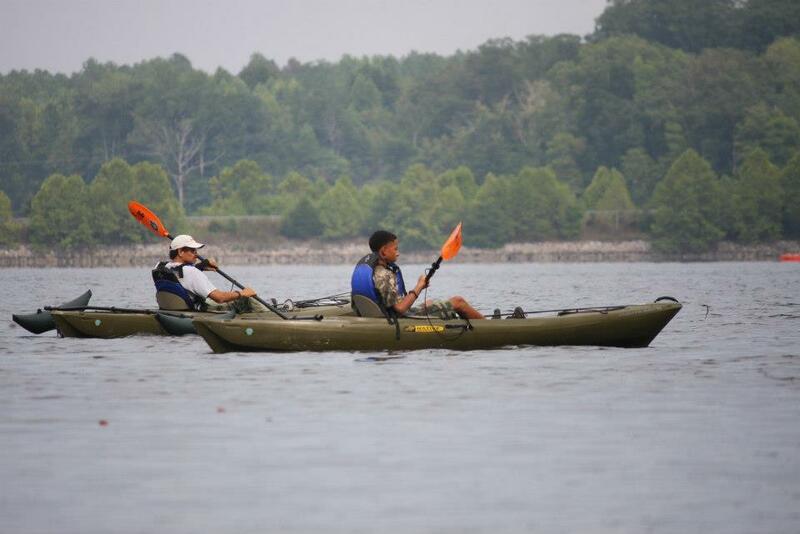 This past weekend was the annual club challenge in the Tidewater area. It is an annual tournament where angling clubs in the region can enter one boat with a team of four anglers and one captain (non-fishing). No deck hands or other people are allowed on the boat. The tournament had various clubs represented, including: Tidal Fish, Tidewater Anglers, Great Bridge, Portsmouth, Central VA, Norfolk Anglers, VA Beach Anglers and the lone kayak-based club from the region, the Tidewater Kayak Anglers Association. The rules were pretty simple......there were 15 eligible species, an oyster toad calcutta and any VA salt water area was fair game. The fishing window was limited to lines in the water at 5am and the teams had to be in line at the weigh-in no later than 5:30pm. Each species had points values of 3,2 and 1 for the top three weights of the fish entered. As an angling club, you could only enter three fish in each species, but you could not weigh in all of your fish just to determine the heaviest three. You had to fish to weigh and could not change your mind once the fish touched the scale. As a club, we were permitted to have a total of 5 teams of 4 kayakers each, but we ended up a few short due to last minute cancellations and logistical issues. We were able to field 5 teams still but with 3 people per team. In the end, we sent two teams to the Poqouson area, a team to the HRBT and two teams to the CBBT. Of the fifteen eligible species, the TKAA group was able to enter fish in 10 of the 15 categories. The TKAA team members were a relative Who's Who of avid kayakers from the Chesapeake Bay region......we had: Rob Choi, Justin Mayer, Seth Goodrich, Matt Anderson, Bill Ragulsky, Mark & Kris Lozier, David Saunders, Joe Underwood, Richie Bekolay, Chip & Drew Camp, Ken Cussick, Russ Hamm, and a few others that I am at a loss for at the moment......(I'll add the names as I get them all in......). When the weigh in was finally over, TKAA had registered 2 citation sheepsheads and had placed high enough to have winning fish in a few different species: 3rd place Croaker, 2nd place Sheepshead, a clean sweep of the Spadefish of all three placings, and a 2nd place Speckled Trout for a total of 11 points and sole possession of 3rd place overall against the seven other angling clubs. I was proud that my croaker placed third overall having never really targeted them before. 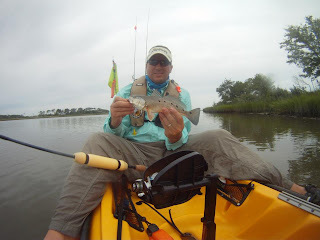 The day on the water was filled with several non-event species including countless redfish, a few rays and a nice 30"+ striper that towed me around for five minutes. The results do not accurately represent the challenges that all the clubs faced on this day. The weather was very sketchy across the entire region. Every team had to brave 5-8 foot seas at various points and some nasty wave chop around the tunnel complexes. Even the Poqouson teams battled winds in excess of 20mph and ripping currents. The tunnel teams battled some dangerous conditions that even forced a few team members to check their hulls for taking on excessive water from the crashing breakers and do some preventive bailing during the day to avoid a dangerous situation later. In the end, we all returned safely to the weigh-in and spent the rest of the evening reminiscing about the day that was in a word - challenging to say the least. The ultimate goal of this club challenge is not the bragging rights or the trophy awarded at the end of the day. No, the real winners are the children that this challenge was founded upon. Hopefully, the money and awareness raised by this event will permeate through the communities in the region, and we can make a difference in the life of child or several in the future. When all was said and done, the TKAA group proved that we can fish and are quite comfortable sharing the waters in the realm of giants. This past weekend was one that posed not only logistical challenges for me, but also physical challenges. You see, the weekend for my family was to say a little hectic, and by the end of it, I was physically spent and put nearly 1,000 miles on my vehicle in three days. I started the weekend off on a Friday with my scheduled day off. 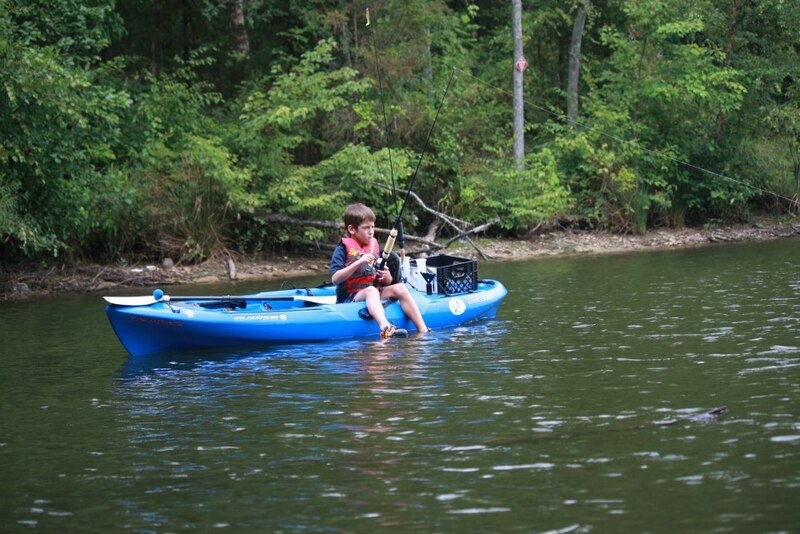 So of you have already read the tale of how I chartered a kayak guide for my son on Friday. Well, that was only the beginning of what would be a non-stop weekend of events for me. 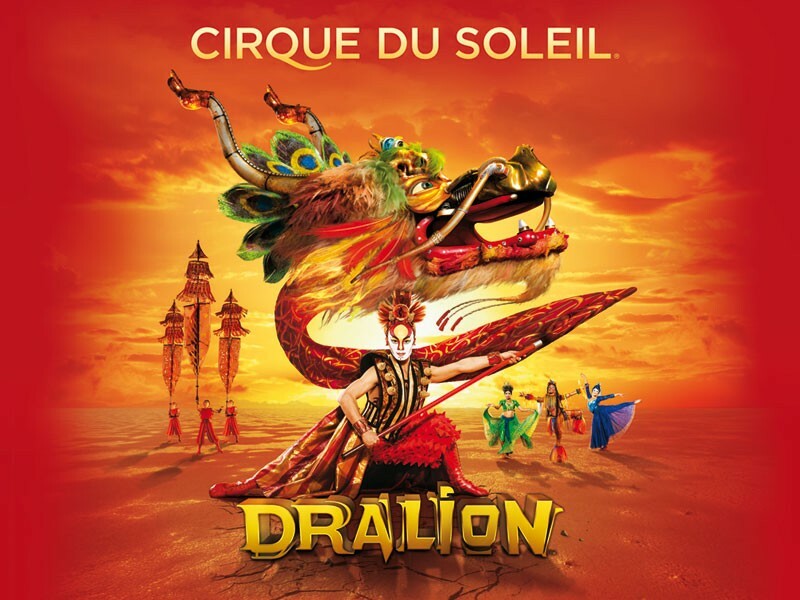 Friday night was family night, so I treated my wife and son to an evening out to go and watch our first Cirque du Soleil show, this one was Dralion. All I can say is WOW! Those folks have some serious skill. The show was amazing and my son fell asleep believe it or not towards the end of the show. So, we headed home, but the stay was short lives since I was up at 4am to head to Rudee Inlet for a Tidewater HOW event. We had a handful of veterans joining us this morning, and we wanted to get them on some fish. So I arrived just as the sun was peaking over the trees and headed out to pre-scout the water and locate some fish. Unfortunately, it was right at the peak of the slack tide, so except for the occasional breeze, the water was very still and the morning took on an air or tranquility. I figured since I had arrived a little early and the fish weren't active yet, I would pedal about and check out the various signs of life that might be up and at 'em this early in the morning. 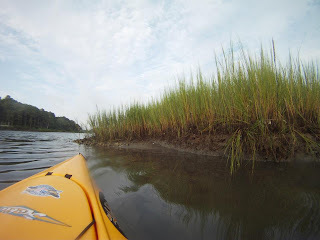 Along the far side of the inlet, there is a grass flat with some oyster beds and small channels that flow through them at high tide. When low tide is present; however, all of the small critters are exposed and the stalking predators like herons, egrets and the like are out in full force looking for an early breakfast. At low tide, it is a great opportunity to explore areas and their respective natural features that you would normally not know existed when high tide is upon you. I was able to see various cuts and lay downs I did not know were there. I even took notice of the depth changes around the grassy out cropping to get an idea of how much tidal influence there really was like the image above and the one below. As the morning wore on, it was time to make my way back to the launch and help unload the heroes kayaks for the day and get ready for the event. By the time we launched, it was close to 9:30am and the incoming tide had started to run. The wind decided to blow in the opposite direction of the current, so fishing the incoming tide was not as easy as we had hoped. After a few unsuccessful drifts and casting perpendicular to the current, we found our way over to a spot where everyone could get a break from the wind and still cast a line. We set up on the shallow oyster bed and cast our lines in the water. Almost immediately, everyone started getting bites albeit from little puppy drum, but a fish is a fish!! Almost every cast had one of the participants, including volunteers hooked up with a fish. Even our fearless leader, Tom Vanderheiden the Tidewater Chapter President, got in on the action with several puppy drum and a surprise fish for the day - a baby black drum!! It was a great way to round out my morning, but alas I had to part company with these folks, skip out on lunch with them and make my way westward. I had to go home and pick up the family for phase two of our Saturday, a second HOW event, only this one was with the Central VA Chapter. I made it home and loaded up the family and hit the road. We arrived at Sandy River Reservoir a few minutes late, but no real worries since Mother Nature had decided to rain for a bit anyway as we nearing the site. Once the rain passed, we launched with my hero and his grandson. This was only the second time his grandson had ever been in a kayak, but he seems to be making headway and getting the hang of it. The winds were blowing straight out of the south which makes fishing the normal spots along the western banks and northern pockets a tad difficult. We sought out refuge in the coves until the winds laid down enough to make our casts easier and more accurate. The sudden change in weather and the winds made it a tough day on the water. My son didn't let it bother him though, so I staked him out in the back of a cove and showed him how to sit side saddle and cast out into the open cove. He persevered and toughed out a day with difficult conditions. Each time I head out with a hero, I try to impart some form of knowledge or tactic that might increase the odds of catching a fish. On days like this, I had traditionally found that largemouth do not like to hang out in exposed water with no cover, so I headed back into a protected cove and started targeting outer edges of grass lines. On the very first cast, I hooked up with a smallish 12" largemouth. I made my way over to the opposite bank and started punching the grass mats though the open holes and found a third hungry bass. This one got hung up in the grass pretty deep, which is always a possibility when using this technique. Since I was using my finesse spinning setup, I couldn't power the fish out of the grass for fear of the leader snapping. I pedaled over and found the fish entangled in the grass mat and had unhooked himself and was just laying there. He was the same size, so I didn't bother with a photo and just freed him to go about his business. 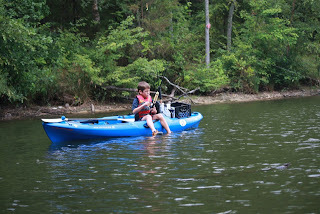 While my hero I was paired with didn't catch any fish, he did have some bites, and his grandson caught his very first fish from a kayak - a small channel catfish. I was too far away to get a good photo in time before the fish was released, but you could see he was content. Unfortunately, the outing was cut short by the dinner bell, so we all headed in. Today's meal was provided once again by Charley's Waterfront Cafe. Today's meal consisted of a chicken and sausage fettuccine dish with french bread and fresh watermelon - YUM!!!! I finished off the weekend with another family outing on Sunday - a live concert for my son and wife. I went sort of old school, well for me it was. I took them to see Def Leppard and Poison - my son loved it and asked me the next day....."Daddy, when can we go see that concert again?" Be safe out there, tight lines and make time to spend with your own family, whoever they may be in your life! This past Friday, I had the opportunity to share the water with two amazing people, my son and Mark Lozier of 1st Landing Kayak Fishing Services. I had never chartered a guide before, but I wanted to leverage the expertise of a trusted friend while also supporting the local economy. Plus, the added reinforcement of how to do certainthings while fishing coming from another person wouldn't hurt in the "education" of a future angler. The last few trips I had taken with my son were not as productive as I had hoped, so I wanted to switch it up a bit. We decided the Poqouson area afforded the best opportunity to try for some larger speckled trout and redfish, so we set our date and the launch time and patiently waited for Friday to arrive. When I left the house, I had no idea that mother nature would not be kind to us on the day. Mark had arrived ahead of us and had tested out a couple of the potential locations and found the top water bite to be promising. He had three nice blow ups to set the stage for what would prove to be a challenging but still very enjoyable day on the water. When we arrived, the winds started to blow in earnest and made holding position in our planned area a little difficult. We worked a variety of presentations under the choppy surface - a Marsh Works Bayou Thumper (3 different color patterns between us - Croakaine, Margarita and Shrimp), a Mirrolure topwater, two different popping cork rigs and a gold spoon - no bites were to be found. I switched over to the crystal color pattern with a chartreuse tail and immediately had a hit, but later learned it would be a crab. When that location failed to produce, we attempted to move to another area with an extended flat, but we found the wind and chop to be a bit much, so we headed back to our original setup location. When we got there, the winds started blowing even stronger, so we headed for a sheltered cove. We found a nice pocket with very minimal wind, so we staked out in a spread pattern and started searching for fish. We started to see some surface activity with little finger mullet busting in sporadic spots along the edge of a small channel, so we had my son and I throw our popping corks out into the channel and allow the incoming current to bring it along the channel ledge. We were also working our moving presentations as well. After a few minutes, I finally get a strike but miss the hook set. My son follows in short order with what would be his only catch that day - a small crab. My next cast landed the only fish of the day for all of us - a rat red loaded in spots - 17 in total, 8 on one side and 9 on the other. We kept at it - my son missed three fish that I know of. He is still learning how to detect the "bite", and this was his first go at using a popping cork. All three of his misses were from having too much slack in the line when the fish took his bait and pulled the cork under. No worries - Mark was gracious enough to donate a popping cork setup to my son to keep and practice with. I'll take him minnow fishing with me to a good spot that he can use it with so he can get some more practice and be ready for the fall speck run in a couple of months. As I was sitting there taking in the scenery, the wind shifted just slightly and turned me a little sideways. It was then that I noticed the nasty thunderhead fast approaching, so Mark and I looked at each other and both agreed to call it a day. It was about time to end our day anyway, so mother nature just eschewed it along a few minutes ahead of schedule. As we rounded the point on our way back, the winds blew in strong at 20+ easily, just as it had been doing for most of the day out in the open water where we started our day. Mark an I couldn't believe how strong it was. I wish the forecasts were more dependable. I checked three different internet based forecasting utilities and none of them had predicted the winds that we were experiencing. While the day was not as action packed as we had hoped, it was still quality time spent with my son and with a good friend. 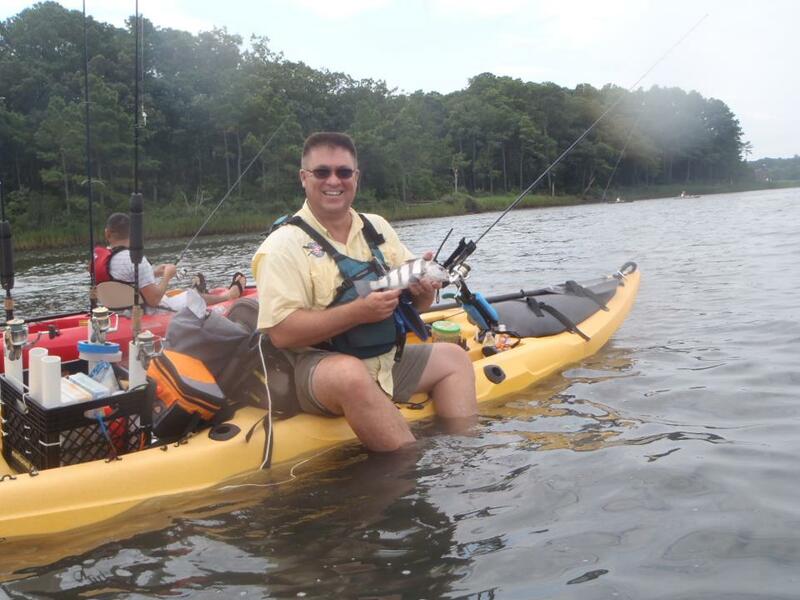 If you ever make your way to the Chesapeake Bay area, whether it is for a vacation, you live in the area and have never tried kayak angling or you are an angler that primarily uses a boat, I strongly encourage you to reach out to Mark Lozier and setup an outing for yourself, or even with other members of your family or fellow anglers. 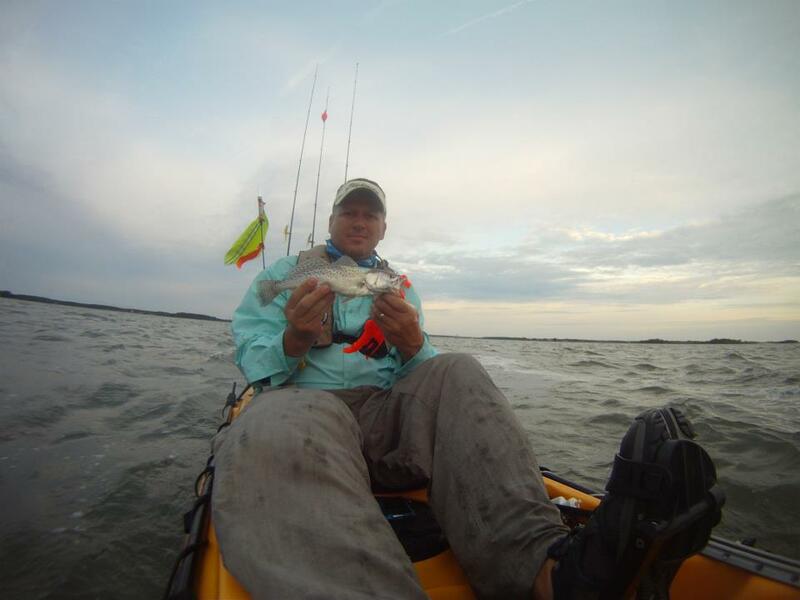 The experience of catching a fish out of a kayak is one that every outdoor enthusiast should experience at some point in their life. 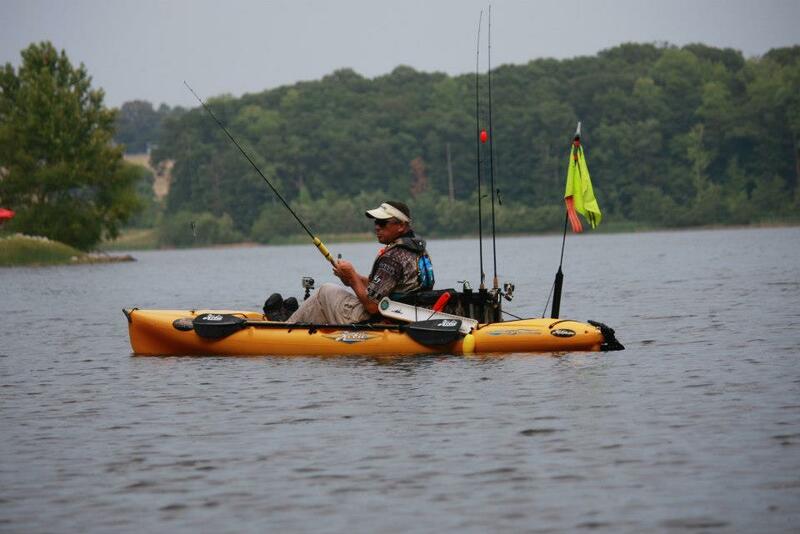 Once you do, you'll find that a kayak is an exceptional tool to add to your fishing arsenal that will help you catch fish in places where others cannot reach. Tight lines, be safe and get out there and experience the kayak fishing lifestyle!! As the picture above and the title suggests, it is important to go out and apply what you have learned. Whether it is a training program learned by members of our military and applied during training sessions like you see above or something as simple as using the techniques and tips taught to you by individuals with the knowledge and expertise. The latter is what was laid before my friend Joe and I today at the Chesapeake Bay Bridge Tunnel. My last few outings have not had the measure of success I had hoped for - last year's trips resulted in nothing more than one oyster toad. This year's trips have resulted in lost gear and nothing but croaker. 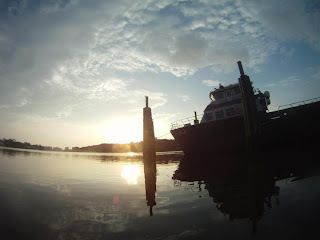 When I attended the evening session with Kayak Kevin last week, I wanted to see if I could identify what I was doing wrong in my past excursions. What I learned primarily is that I wasn't doing anything technically wrong, rather I was not fishing in ideal conditions. You see, every time I have ventured out to the tunnel complex in search of fish, I noticed that have each time the current was .7 or above and the winds were not optimal. Today was an opportunity to try and change that. Today's conditions were still ripping for current with a .8 falling tide, but the winds were forecast to lay down at 1-3 out of the WSW by mid-morning. Joe and I met at Ocean's East 2 and purchased the requisite bait for the day - fiddler crabs and clams. We launched at 7am and made our way out against the stiff current - it was tough sledding for the better part of an hour until we reached the first island. From the first small boat channel to approximately 100 yards from the island the "red tide" was in full bloom. Not good. The algae bloom actually reduces the oxygen in the water and really turns off the bite in that vicinity, so we continued all the way to the island. We dropped our lines in and immediately had bites and lost fiddlers. Promising one would think, but Joe and I spent the better part of an hour battling current and other boats with nothing to show for it but empty hooks and a lot of pedaling. Joe decided to switch it up and try drifting and jigging for some flounder. I wish I had done the same, but I had left my flounder rigs in the van to focus on sheepshead and spadefish. Even though the seas were rolling pretty good, Joe managed a couple bites but no flatties in the boat. After losing 12 fiddlers with nothing to show for it, I was getting a little frustrated to be quite honest. The current was so strong the even the eddys were difficult to hold position in. My seat are was washed over several times by crashing cross waves next to the pilings. After a few too many close calls against the pilings, I made the decision to switch tactics and focus on spades for the next hours or so. We had planned to be off the water by 1pm due to the forecast calling for storms rolling through the area later in the day. I baited my line and made my way to the first piling I could find that had clear water. Joe followed right behind me after having no luck with the flounder. By this time, it was getting close to 10, so we needed to make our move and try to improve upon our success rate on the day. I found a set of pilings that had several feet of clear water and no hint if the "red tide" anywhere near, so I maneuvered into position and saw what I thought was a quick silver flash. I dropped my line in the water and immediately had a surging strike that started shaking furiously - the tell-tale sign of a spadefish bite. Rule # 1 when fishing for spades, set your drag light initially or thumb the spool to try and avoid ripping the hook out of their tender mouths. Guess I forgot to heed this rule, since the first and strongest hit of the day resulted in a lost fish. I quickly baited the hook again and dropped the line once more - Fish On!!! The current was still moving at a good clip, so this time when I dropped the line, I left the spool engaged to free-spool the line. When the spade hit this time, I simply set the hook and thumbed the spool allowing the fish to pull without ripping the hook out. As the current pulled me away from the piling, the spade had no way to get me wrapped and break the line. A few seconds later, the fight was over, and I had my very first spadefish - a chunky little 10" fighter! Finally!! I was pumped. With the adrenaline flowing, I quickly re-baited my hook an made my way back to the same group of pilings. A few minutes later.....my second spade on the day. This one was a little smaller but extremely fat. It measured in at a scant 8" but the fight was much better that the size indicates. Still riding an adrenaline buzz, I re-baited again and made my way back to the pilings only to find that the current had swept in the "red tide" as the clarity of the water started to drop significantly. The next hour was spent chasing pilings with clear water. I had several more bites and lost bait, but the bites weren't from spades. Another CBBT bait stealer was the culprit.......baby sea bass. Joe had landed several at this point, and I found out I was not immune to them either. Joe was working hard trying to find some spades having only sighted one on the day so far. It was tough sledding there for a bit with very little action. Once the current started to slack off around 11, we knew this would be our best chance at holding position over top of them and waiting for the bite.......unfortunately, it never really turned on. Joe and I worked every set of pilings from the second small boat channel all the way to the first small boat channel with no real action to speak of. I ended up getting one more spade and a couple more sea bass for a total of six fish on the day - 3 spades ad 3 sea bass. While the numbers weren't exceptional by any stretch of the imagination, this was the first time in four outings I landed a targeted species. I am still waiting on that first sheepshead, but I know it will come in time with continued persistence and patience. If you have the chance, study up on the techniques for targeting spadefish by ordering Kayak Kevin's Kayak Fishing the Chesapeake Bay 2 - The Summer Species DVD. It will show you the rod, reel, line and rigging techniques used to target spades at the CBBT. It's what I use!! Until next time, be safe, tight lines and apply what you learn! The last couple of years I have seen fewer and fewer reports of redfish in the inlets that are part of the Chesapeake Bay fishery. Perhaps some of these folks are not sharing their catches for fear of predation by man, but I have spoken to a few kayak anglers from this region, and they tell tales of years where you could fish on any given day and consistently catch redfish one right after another. When I first began my quest for my own redfish, I was only able to manage one over the course of 4 months fishing out of Lynnhaven and Rudee Inlet. I was determined to add this species to the bucket list of fish I have caught. On my very first outing nearly three years ago, I spooked two over slot redfish and later caught an 18" pup in a different location. It was at that moment that I knew the redfish would be a species on the short list that I would target in the future. Last year, I didn't even see one caught when I was on the water, so my confidence in the overall health of the population was shaken. Fast forward to this year. If the action of the last few weeks is any indication of the future, the redfish may yet again return to prominence in this region. Well, I headed out with my friend Joe Underwood to target some speckled trout after reading several of the recent successes people have had in the area. Our original plan was to chase spades, sheepsheads, flounder and togs at the First Island, but the winds were blowing in strong and would have made fishing there almost too risky. We decided to stay a little closer to shore and target specks instead. I arrived at the launch 30 minutes ahead of Joe, so I headed out for a quick recon on the weather and found the winds to be a tad too strong for any of our planned drifts. The winds were 17 out of the SSW with gusts forecast to be in the mid to high 20's. I made my way back to the launch and waited for Joe. Along the way, I fished a grassy shoreline and quickly found a small school of reds that were hungry. I was using my favorite jighead paired with a chartreuse Gulp swimming mullet and dragging it slowly with a subtle hop once in a while. With the winds blowing so strongly, casting was limited to strainght into the teeth of the wind or straight downwind unless you felt like dealing with a bunch of slack line and missing a hook set. I made multiple casts after each repositioning of the kayak to cover the shallow flat I was staked out on and landed a total of 3 under slot reds in a 10-15 minute window with the best one measuring right at 13". Once Joe arrived, we made our way out to the channel to try and drift along with the wind, but the wave chop started to get a little "snotty" and tossed us about pretty good. We made the turn and pedaled our way over to our primary target area. Joe was drifting a little further out than me to see if there were any takers along the channel ledge, and I hung a little closer to shore to see if I could entice any more reds into the yak. As we approached our primary target area, we found the creek mouth to be completely blown out and too difficult to try and maintain a good boat position. So we headed back into the creek and sought out shelter from the wind and began to stalk the grass for some more fish. There were visible signs of baitfish being pursued, so we felt our chances were pretty good. I had brought 3 setups for the day - topwater, jighead and a popping cork rig with a Marsh Works Killa Squilla and Shrimp Hook tied on. After a few minutes in the sheltered water area, I knew the high winds would not help me with my top water plans, so I simply drifted the popping cork rig giving it an occasional pop and cast the jighead rig into the banks and worked the slow hop/drag technique again. This technique proved relatively successful for the better part of the morning. I ended up catching 5 more using this technique, including my very first fish on a popping cork - way cool!! We would probably could have caught more if we weren't determined to stay out of the teeth of the wind so much. I know the shoreline leading up to the creek mouth is loaded with fish on calmer days. It was a great day on the water with a good friend. Even though we didn't catch our targeted species, we did catch some fish and enjoyed each other's company on the water. So far this year, I have caught 15 or more reds in two different locations several miles apart from one another and all of them were healthy looking with exceptional coloration. If the numbers I have caught are any indication of future populations of redfish, then the future is looking pretty bright. Until next time, stay safe, take a kid fishing and leave the water a little cleaner that when you arrived. The goal of the day was simple - find some snakeheads, catch them, kill them and eat them or give the meat to someone who wanted it. I met Seth (smbassassassin) and Mike (redfish12) at the launch and we set out with a plan to target snakeheads along the edges of the spatter dock (basically tall lily pads that extend out of the water) and in the holes we could see amongst the grass beds. We also had a secondary plan for the day to try for some tidal largemouth as an alternative if the snake hunt proved unsuccessful. Our adventure found us launching at the end of a falling tide, so the primary target areas we had hoped would hold fish were already too shallow in the first creek fingers we explored. So, we moved out of the creeks and back into the main stem of water. Although the grass beds were super thick, the water was exceptionally clear and sighting fish was almost too easy. Unfortunately, the wind created some visibility limitations due to mild chop on the water surface, so we ended up spooking more bass than we landed. We all sighted several bass in the 14-17" class which I later learned was known locally as the "Potomac Special", as well as some spunky little yellow perch, chunky bluegills, a couple of fat 24"+ blue catfish and several snakeheads including one that was easily 40" plus. 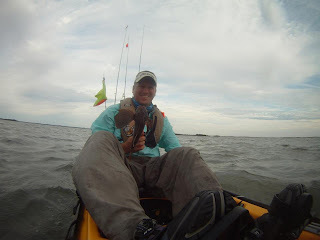 The primary target was still the snakeheads, so when we made the turn and flowed with the outgoing tide, we focused primarily on looking for the tell tale signs of bait fish frantically fleeing, otherwise commonly known as "nervous water". This is an excellent indicator that a predator of some form is nearby, for snakeheads, it is fairly easy to tell. To me, it looked like the surface waking in front of a school of upper slot redfish. You could see the waking on the surface from as far away as 50 yards in some cases. Pretty soon, we moved out into the bay area and started watching the shallow grass covered flats for the waking action of a irritated snakehead, and it wasn't long before Mike sighted them first. He found a cut in the grass beds that basically acted like a freeway providing a direct line deep into the grass beds from the main channel. As he sat amongst the outer edges of the grass beds on one side watching the cut, I positioned myself on the other side about 30 yards away. After five minutes of watching and waiting with little action to speak of, I decided to target the thicker grass mats that had small visible pockets. I had missed a nice one a short while earlier using the same pattern, so I figured I would try it again. Glad I did. A massive blow up was my reward and the end result was a nice 17" "Potomac Special" - the largest one of the day. Shortly after that, the waking action started again only this time it was more frantic. We later learned that the waking was from at least 3 different snakeheads. Mike was tossing a super fluke with a paddle tail style bait, and I was using the trusty old Ribbit. Mike had the first strike but failed to connect. When the snakehead did not show any more interest in Mike's offering, I moved into the grass beds further in than Mike and cast perpendicular to Mike's casting area. This resulted in an aggressive follow and enormous wake action but no take. I started casting parallel to Mike's line but opposite of his direction. My very first cast was immediately followed. As I slowed the Ribbit to a painful crawl, the feet kept churning along with a rhythmic "blub blub blub blub" noise that apparently infuriated the snakehead. He exploded on my frog and spat it before I could even blink. It was a violent strike and one I will not soon forget. The water's surface erupted like a volcanic explosion, and I caught a glimpse of the head and knew I had just missed a quality snakehead. As we moved along the deeper channel, Seth motioned me over to try and help entice some larger bass he was sighting. I moved around to the opposite side of the hole and tried a few casts with no takers. I decided to approach the hole from a different direction but I didn't see any fish. I decided to move over to a duck blind nearby and work the edges. I was not prepared for what happened next. I had switched rods over to a fluke style bait with a paddle tail and started casting and working that along the edge of the duck blind. I made a half-hearted cast directly into the center opening under the duck blind in the hopes of picking off another bass. I wasn't prepared for the 40" plus snakehead that was apparently resting under the duck blind. When he launched out from under the duck blind and eschewed my fluke out of his area, my heart skipped quite a few beats. After a few choice mutterings under my breath, I couldn't entice any more strikes from this beast even with the Ribbit, so Seth and I moved on. Seth and I continued to work our way around the tidal bay and spotted several more measurable fish but none were caught. By this time, Mike had moved on from the initial target area decided to try a couple of different holes that had produced in the past. Although Mike ended up with a couple smaller "specials", fish are fish and any fish caught is better than none.\ Although we did not have an exceptional day from a numbers perspective. All three of us caught fish, and we even were privileged to see Mother Nature on full display. A Potomac River tasty morsel, rather shell from a molting crawfish. The amount of snails, and large ones at that, was quite surprising. This one was easily 4". All in all it was a successful day. I learned that the snakehead is an awesome predator, no matter how unwanted the species is. You have to appreciate the shear size and speed of these creatures and how protective/territorial they can be. I also realized that I was unprepared for the other species that inhabit these waters. I will remember next time to bring a couple spinning outfits - one for small soft plastics and the other for a panfish style presentation. I am already anxious to get back and try again. Now that I understand how Territorial these creatures can be, I know a couple spots that I will be targeting when I return in the near future. Thanks again to Mike for the suggestion of the location, and to Seth for spending time with a couple of Hobie nuts. On a side note, the grass was so think that Mike and I paddled our Hobie Revolutions all day and didn't have any issues of note except for the cross winds blowing all day which made holding a track interesting to say the least. Until next time, be safe, tight lines and always remember to leave the water a little bit cleaner than when you arrived! I really felt connected to this catch, because the fish was caught on a lure I picked out, rigged personally for him with my terminal tackle, and set the drag for on his reel before heading out. We started the afternoon by working the shaded side of cover and experienced infrequent subtle hits but no solid takes. I was using a stick bait rigged Texas style and my hero was using the small profile creature bait that I had rigged with a Confidence Baits 1/4 oz Draggin' Head. I had the first fish on a short while later when I skipped my stick bait onto the bank and twitched into the water. It was crushed immediately. You can see how much shade we had to work with in the image below. A close examination of the location found a steep drop off from the bank into about 2 feet of water directly in the shade - a prime location on a day where the air temps were reading 92 degrees plus and water temps on the surface in exposed water were only 10 degrees less. When the activity of the fish waned, we paddled over to a cove that has produced some quality fish in the past for various folks. I did a quick recon of the area ahead of my group to check water clarity and depth and found the depths to be only 3-4 feet deep for a considerable distance from the shore with murky water conditions. I advised my hero to cast over towards the bank but to fish the area 15-20 feet away from the shore and work the lure back slowly along the bottom onto the deeper ledge drop off. First cast using this pattern - BAM! Fish on! An overwhelming sense of satisfaction and enormous weight was lifted from my shoulders. Now, I have helped some heroes get on some fish in the salt at last year's TKAA Charity Tournament, but locating fish in Rudee Inlet is far easier than at the other locations, because the fishy locations within Rudee are well known, hence the reason our heroes have such overwhelming success there. However, the last two years has been a frustrating time for me in the freshwater locations when accompanied by a hero. As a volunteer at these events, you are regarded by the heroes as an "expert" in how to catch fish at that given location on any given day. For me, Sandy River and Bear Creek have always produced fish, but when I have located the fish in the past for our heroes, their hook up ratio is not as successful as I normally experience. Sure, you could rationalize some of the factors beyond their control like: lack of experience with the given body of water; reading the water and knowing where the bite will come; the higher end equipment and line choices I use, etc., etc.. It still doesn't cure that ill feeling I get after an event where I was able to land fish and my hero was not. It was a relief to finally be successful for a change and lead my hero down the path to success. It was also very humbling to hear my hero emit the words to his grandson, "You see, I told you he was good. He knew exactly where that fish was and what would work to catch him." Now, we're taught by our elders at an early age to not be boastful or even envious of others and their successes. But for this day, I was truly envious of my hero's success in a way, and I will be boastful for him for he has been long overdue for success on this lake. Words aren't enough to try and convey the overwhelming sense of fulfillment and accomplishment that welled up inside of me. Next to the unconditional love of a child or spouse, I would contend that a relative stranger prior to these outings placing complete trust in your ability to lead them to fish is a very fulfilling feeling. Until next time, be safe, tight lines and thank a service member for everything they have freely given for your freedoms. .........and he got bit!! This is a quick tale of how a kayak angler, myself, made the tactical decision to try some top water froggin' at my local neighborhood pond in a limited time window. My friends Rob Choi and Richie Bekolay have been tearing up some fish recently, so they inspired me to make the committment to get out on the water even with limited time. I only had three hours, before I had to make my way westward for a Central VA HOW event at Bear Creek Lake state park in Cumberland, VA. I launched at 7:30am and made a bee line straight to my favorite part of the pond. This area is loaded with lily pads but there are several pockets where the pads extend out creating various ambush points. I typically will work these pockets almost exclusively. I start each frogging session by casting outside the pocket to work the open water and pick off any potential smaller ones. This is what one of the typical pockets looks like when it extends out into open water. Occasionally I will find a larger one out further but the water temperatures have to be optimal for that. With the recent heat wave here in Central Virginia, the water temps had climbed to the 85-87 degree range. Most of the time, the larger ones will hang out where there is ample shade yet still opportunity to ambush any prey that venture into the kill zone. After the initial cast beyond the periphery of the pocket, I work each cast closer and closer to the apex of the pocket until I am can work the frog over the apex and even across the last few pads. This is the prime target zone where I usually encounter my strikes at this pond. Today's color choice due to the slightly off-colored water from the recent rains was one of my favorites, the Catalpa Stanley Ribbit. I prefer to use the Zoom Horny Toad hooks in 4/0 size for these 3 1/2" frogs. For the Bull Ribbits, which are the larger version, I use the 5/0 size. I have tried the Owner version of these hooks but find their keeper pins with the centering post increases the chance of the frog's head getting ripped out. One rigging tip I will give you on these frogs is that the plastic is heavy duty and made to withstand multiple hook sets, unfortunately that means the plastic can be a bit firm when you first rig the hook through the back of the frog and lay it in the back channel. I typically work my hook through the plastic a few times to decrease the chance of the hook not penetrating far enough for a good hook set. You know that scene in jaws when Roy Schieder sees the size of the shark and emits those immortal words, "You're gonna need a bigger boat.". Well, that was the thought that immediately crept into my head when I saw the size of this bass when it came up out of the water. I can still recall the bulging eyes that glared at me as the sow bass made one final lunge downward in hopes of tossing the hook. Well, she succeeded but not from a failed hook set or throwing the hook. No, the loss of this fish was due completely to an ecological factor. A wad of the algae that is rampant in this pond during the summer had lodged itself on the hook point and impeded a proper hook set. I emitted a few choice words and gritted my teeth knowing that had I landed that fish, it had the potential to mark my first citation ever out of the kayak. Those are the breaks when you fish these types of water....sometimes you win, sometimes the fish wins and sometimes you just have to chuckle and move on. So I did. I made my way down the shaded side of the pond knowing from past experience that the water temps can get pretty hot in this shallow pond. Now is a good time to impart one of my stalking tips I employ when looking for a fish to target. Most people will make repeated casts until they get a strike. For me, fishing frogs requires a discerning eye and being able to identify where to cast. The key is to try and maintain a stable and relatively slow drift or no movement at all. This enables you to focus on the pads themselves and look for movement of the pads. The sounds of feeding bass are easy to pick out but targeting the bigger bass lurking in the shadows takes patience. I have to be honest here and admit I was doing it half-heartedly given the limited time window that I was working with. I was only focused on specific areas that have held fish in the past but still applying my stalking tip. I found a large shady pocket and worked it for a few minutes and was about to move on when a bass chased after the frog and failed to connect. 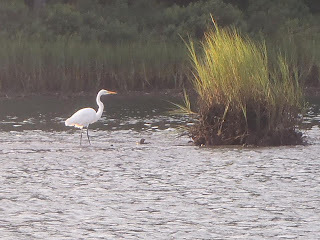 I paused and made a few more casts at a small outcropping of pads that showed signs of a moving fish in the murky shallows and was rewarded with a spunky 14" fighter from the outermost point of the pads next to the tree you see by my left shoulder. I worked the same shoreline for the next 30 minutes or so targeting the same type of locations. At one point, I sat looking for any signs of movement for close to 20 minutes and became very anxious with my window of opportunity decreasing more and more with each passing minute. I kept scanning the random patches of pads looking for any hints of a predator when a slow moving pad being pushed towards the bank caused me to take notice. If the movement was any indication of the bass' position, I would need to make sure the path of my retrieve would need to be close enough to attract attention but not so close as to startle the fish and risk not having a chance at a strike. I decided to make a cast a little further out than intended just to give the bass some turning room. I watched the pad stalks closely and noticed it move sideways indicating the fish had turned. A follow up cast a little closer to the target area sealed the deal, and I was rewarded with a chunky 15" largemouth for my patience and efforts. I worked a few more spots with even less interest, because my time was at an end for this outing. I ventured further down the eastern arm in hopes of landing the near citation from last year but found my spot completely changed from fallen trees due to several recent intense storms. I'll have to come back andwork this area a little more precisely with some other presentations. In the coming weeks, I will be making a more concerted effort to work in some frog action for you. 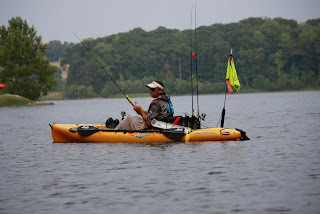 After all, it is the namesake of my blog and how I started chasing bass out of a kayak to begin with! Until next time, tight lines, be safe and take a kid fishing.